When you want to make the right impression, having a strong exhibition stand at the event or trade show you’re attending is key. People will be overwhelmed by everything going on around them, so in order to stand out you really need to grab their attention. 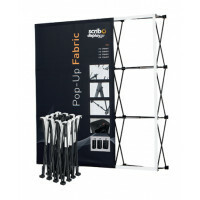 A tension fabric pop up display stand from Scribo will really help you out with that as when you buy from us, they also come with a fully customised printing service, allowing your company graphics to be seen by everyone at your trade show. We provide the best exhibition display stands and graphic prints for your event needs, and we’ve already helped many happy clients across the UK find theirs. Your tension fabric pop up display stand obviously needs to create the right impression with your very own customized graphics and images at the event you’re attending or in your showroom. But that’s something that’s only going to be possible if it’s first of all strong, durable and reliable. We’re proud to say that we believe our products are all three of those things, and not only that they are made from eco-friendly materials and are much easier to use than traditional pop up[ displays that are made from PVC or Vinyl substrates. 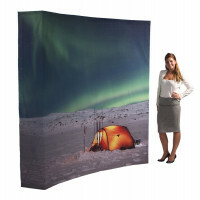 As well as being reliable and strong, your tension fabric display stands also need to look visually stunning. For many people, this is the most important thing of all. After all, having one of these pop up display stands in place is about catching the eyes of customers and creating positive first impressions with your printed company graphics and products. We have curved panel options that can show your appropriate graphics and images that are all fully customisable and ensure anyone who sees your display stand will be immediately impressed by what you have to offer. They’re also incredibly easy to set up despite their professional appearance. Events can be challenging when you’re competing for the attention of a large number of people, and that’s why you should put your trust in us and let us help you stand out from the crowd. With the help of our pop up products, it’ll be a lot easier than you think. With a varying range of curved and non-curved tension fabric display stands on offer, we’ll help you find what you’re looking for in no time at all, and you certainly won’t be disappointed by the product when you’re using it at your event or trade show. They’re reliable, easy to use and built to serve you well as you put your business out there for the world to see. Don’t hesitate to get in touch via [email protected] or 0203 1377 335 if you need any assistance and we can deliver anywhere in the UK.